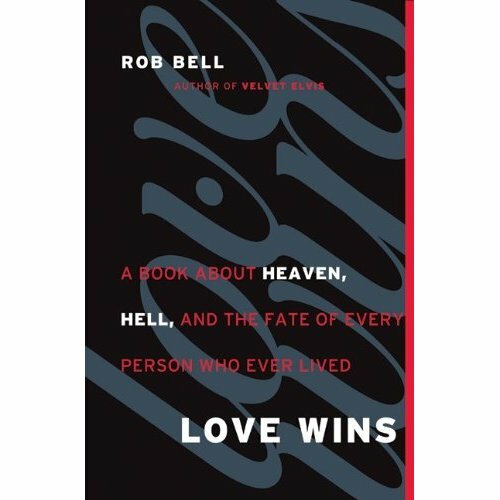 I have to admit two things about reviewing Rob Bell’s book, “Love Wins.” I knew that I liked Rob Bell when I took a doctoral class (DMin) from him at Fuller Seminary, when I got to sit in a room with thirty other people and ask him questions and pick his brain for a few days. I like him a lot. He’s a good guy. Secondly, I figured out in that class where I thought he was likely to go wrong theologically, and I asked him about that specifically. He’s done it in this book. And I’ll get to that. But first, a summary. Rob Bell can claim in interviews to be an evangelical and not to be a universalist because he’s redefined those terms. Evangelicals claim Scripture as their highest authority. Universalists believe that everyone goes to heaven rather than hell. Bell cites scripture authoritatively, but at the end of the day defines the character of God along the lines of what he believes most intuitive, and perhaps most popular. Evangelicals are going to disown him on that one, as when John Piper tweeted, “Farewell, Rob Bell.” Bell does seem to believe in a literal hell, and that people go there. However, he creates a bit of a loophole for the universalists and insists that he can’t imagine a God who would make people stay there forever. So he’s a circuitous universalist. It’s not that there’s no hell, it’s just that it’s purgatory (although he doesn’t call it that). That’s the book. Developing an understanding of God’s self-revelation is a messy thing. God speaks, but then someone else writes it down, and then we read it. In that process, there’s a middle man, who has a vocabulary that means certain things to him. The words in his vocabulary change meaning over time and through translation. We’re never wholly “in the mind” of the guy who wrote them down. And we’re only assuming that God meant by the words he uses exactly what the guy wrote. So you have to come down pretty clearly on how much you take that guy at his word. Imagine someone telling you about meeting a famous person that you already know a lot about. In part you listen to what he says for new information. In part you read what he says through the lens of what you already know about the celebrity. See, if the reporter is the Bible and the celebrity is God, evangelicals have always relied more heavily on the words of the reporter than our intuitions about the celebrity. That’s where Bell is not an evangelical. He trusts his intuitions enough to interpret the reporter through them. So when Bell writes, “Is God our friend, our provider, our protector, our father—or is God the kind of judge who may in the end declare that we deserve to spend forever separated from our Father?” (p53, ebook) he’s created a dichotomy between a caricature of the biblical image of God and his own intuition for what God is like. Clearly, he favors his intuition. And intuitively, Bell isn’t into hell. Bell will claim things like, “untold masses of people suffering forever doesn’t bring God glory” (56) and that the biblical portrayal of hell “isn’t a very good story” (57) and that a God who would allow hell to exist is only “sort of great” (50). Intuition trumps Scripture. He ends up completely subverting certain teachings of Scripture. He suggests (60) that the image of the gates of Jerusalem remaining open in Revelation refers to heaven always being open (and thus hell being temporary), rather than the most obvious sense for the image: the gates are open because Jerusalem is finally safe. And he mentions once but never deals with the image of a “lake of fire” in Revelation, which parallels Jesus’ image in the story of Lazarus, which Bell writes off as a fanciful moralistic tale. He also misuses Martin Luther, who once speculated that God is so powerful that he could bring people back from death and give them faith if he wanted to, though Luther states that there is no evidence that that has ever happened. Luther was talking about omnipotence. Bell uses that to cast Luther as a possible universalist. Now the exegetical sleight of hand is bad enough, but Bell actually coaches the reader on how to do it, and in this he’s to be held responsible as a Pastor. He tells the reader that we need a word to describe suffering and evil in this life, and “hell” is a good word for that, so we should keep the word (49). He says that if people ask you whether or not you believe in a literal hell, you can say “yes,” because Gehenna (37) was a real location and because the genocide in Rwanda was real (38). With a wink, Bell shows us how to avoid the conversation with people who really want to know what we think. And by the end of the book, Bell hasn’t ever come out and said, “Everyone gets to heaven in the end.” He’s only said, mostly in the form of questions, that he can’t imagine how a good God would allow hell to be eternal. Wink, wink. I asked Rob Bell the question, “Given that your preaching is largely based on whatever subjects are most of interest to you at the present moment, what holds you accountable to the biblical canon?” He then told a story about a man in his congregation who knows the Bible well. He said that when that guy thinks Bell is off, he writes Bell letters pointing out his errors. And that’s it. One of the most influential voices in American Christianity is held accountable to theological orthodoxy by the kind of angry critic that most Pastors don’t invest a lot of time in. And when he said that, I had a pretty good sense that if Bell ever went sadly wrong, that’s how it would happen: a celebrity, alone, unchecked, applauded and protected by his fans. I still like Rob Bell. He is, authentically, a good guy, and he really loves Jesus. Ultimately, he’s going to have to decide what happened when God told Abraham to sacrifice Isaac. Because the sacrifice wasn’t just of a son, it was of an intuition for what is right and wrong and what a loving God ought to be like. Abraham chose obedience over intuition, and Abraham is forever after the father of faith. Spot on. The bit about Abraham & Isaac nicely crystalizes things. I’m not even sure “Love Wins” is about hell so much as it is a reaction to evangelicalism (http://thevoiceofonedotorg.files.wordpress.com/2013/03/bells-hells.pdf). God bless! Nice review Jim. This is well thought out. Where is Shane Hipps in this? I dunno. Second in command? Thanks for the post. I, too, reviewed his book. I posted my review on my blog. I think Bell has been heading down this road for quite some time. His last book, “Jesus Wants To Save Christians,” had some very troubling thoughts in it. His promotion of social work over any concern for doctrine has been an ongoing process. I got a little fuzzy with the Abraham analogy at the end. If Rob is the modern day Abraham, the modern day “sacrifice” would seem to be the “obedient” damning of a soul to hell, it would seem like the loving God in the narrative would be saving the soul despite the command to damn it. The church is sacrificing it’s sons to hell, but God saves them in the end. I don’t want to minimize the obedience *at all*, I’m just wondering if the analogy works better for you or Rob. I understand, and thought of that nuance as I made the analogy. Here’s my point. You don’t see Abraham wandering up the mountain going, “God’s totally going to stop this in the end because this is the wrong thing for God to do.” Abraham is actually resolved to let God precede goodness rather than letting his intuition for goodness define God’s character. In the end, God can do whatever he wants to, and maybe we’ll find out it jibed with our intuitions, and maybe we won’t. The call of faith, I think, is to surrender to his will, not to try to make God’s will palatable and popular. And theologically, the move to subsume God’s will under our intuition for right and wrong is not faithful. Wonderful review of Rob Bell’s book, Jim — first rate! I’ve read a lot of reviews over the last couple of days, and yours is both properly appreciative and appropriately cautionary. Thanks for a sanctified contribution to the blogosphere. One blogger well known to both of us has written: “Why don’t folks who criticize Rob Bell for wanting to let too many people in also go after people like that who want to keep too many people out? Why are we rougher on salvific generosity than on salvific stinginess?” Comments like that seem to indicate that Bell’s proclivity for false dichotemies is contagious. As an aid to those who might actually have bought the book in print, I offer these page conversions for the citations you have in the blog. One your best post ever. Good work, Jim. Great review, Jim. I’m saddened by this whole situation and the surrounding uproar, although the book could help spur some constructive discussion on these important questions. Let’s hope the blogosphere does not represent evangelicals’ best attempt at theological accountability for our clergy. oops, seems I misspelled my blog title. It seems I may have to do my blog reading a little later in the day, or perhaps after having coffee. Thanks for the notes. I agree with the value the book places on the here and now. I’d say chapter 2, on heaven, extracted from the book, is by and large a beautiful read. Wow, you read that fast!! Thanks for the clear and concise summary most of all… I appreciate you calling him out on this and wonder what he would say to your Abraham citation. Thanks for this post. I read the book and I liked it. But I found that there were several passages that Bell alluded to or referred to, but never really dealt with in the book. I suppose the one good thing I took away from it was this: I need to quit being so wrapped up in the future and concentrate on what I can do in the here and now.